A woman in San Jose said that she only owned her 2017 Tesla Model S for six weeks. On January 18, as she pulled into the spot where she had been parking for years, she said her car suddenly surged, jumped the curb, and crashed into her office building. In Miami Beach, a man was pulling into a parking space when his 2016 Model S suddenly jumped the cement bumper and hit a parked car in the next space. “He is certain he was braking at the time,” his wife wrote in a complaint to federal regulators. And in Newport Beach, California, a man recounted pulling into his driveway when his 2017 Model S plowed through his garage door and hit his other vehicle, a Porsche. Over the course of January 2018, three different complaints were filed with regulators claiming that the Tesla Model S accelerated, unprompted, as the owner was about to park. The complaints were submitted to the National Highway Traffic Safety Administration (NHTSA), the federal agency that regulates automotive safety and maintains an online, public database that allows anyone to publish complaints about cars. In each of the stories, the Tesla owners describe receiving limited information from Tesla after the crash, other than being told that the they had mistakenly pressed the gas pedal. The owners, in their complaints to NHTSA, say they are sure that wasn’t the case. “When my wife talked to a local Tesla representative, he refused to give us any computer generated report,” the Newport Beach driver wrote. Caused by a rare bug? The idea that a car could suddenly accelerate unprompted has long been disputed by the automotive industry. But some engineers say that rare “bugs” can cause such a scenario. They believe the problem traces back to when automakers switched to a “drive-by-wire” system in the 1970s, or when the direct connection between the gas and the engine was replaced with electronics. Toyota, in the highest profile example, was ordered to pay over $1 billion to the Department of Justice to settle a criminal investigation over sudden unintended acceleration cases. Toyota and federal regulators maintained that the issue was caused by sticky pedals and floor mats, not the actual electronics or software that power its cars. But in civil court, a multimillion-dollar lawsuit alleging that faulty electronics caused the problem ended with the jury ruling against Toyota in 2013. Tesla enjoys an almost cult-like following thanks to its environmentally-friendly, fast, and stylish Model S and Model X vehicles and experimentation with self-driving technology. The company’s charismatic CEO Elon Musk often makes grand claims about the superiority of his high-tech cars, which is why customers who crashed in bizarre circumstances expected to receive more detailed data from the company. But these recent cases aren’t the first time that people have claimed that their Tesla has speed control issues. Last year, a South Korean actor filed a class action lawsuit in which he claimed that his Model X spontaneously accelerated as he pulled into his garage in Irvine, California. The lawsuit includes complaints that over a dozen other drivers sent to NHTSA, describing markedly similar incidents. To reporters, Tesla portrayed the actor as a money-hungry celebrity attempting to blackmail the company. 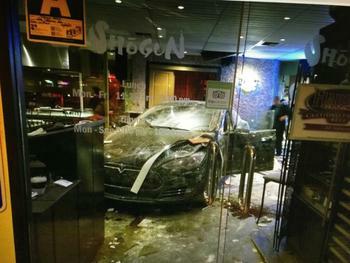 The actor, Ji Chang Son, “threatened to use his celebrity status in Korea to hurt Tesla,” the company said last year. Like many other Tesla fans, Patel remembers her husband enthusiastically reading about and talking about the Tesla before they even purchased one. Shortly after the family installed solar panels on their Bakersfield home, they decided the timing was finally right. In 2014, they bought the Model S, which promises to go from 9 to 60 in 2.5 seconds and boasts a perfect, five-star safety rating from NHTSA. Not long after, their Tesla dream would suddenly come to a disastrous, not to mention expensive, ending. The Patels were meeting friends for dinner but couldn’t find close parking, so they instead parked at a different restaurant across the street. Bhavana was driving. She says the car had almost come to a complete stop as she pulled into the parking space. She remembers her husband grabbing his wallet as she reached for the parking brake. In the surreal moments that followed, Bhavana remembers, she suddenly looked back up and saw that the car was on the sidewalk, quietly moving toward the building in front of her. She still does not understand how they did not feel or hear the car jump the curb. “The way the car just went in, it just didn't feel like a normal car,” she tells ConsumerAffairs. She slammed on the brake with extra force, she remembers, bringing the car to a stop, but not before it had crashed into the restaurant. She remembers the sound of people screaming. The first thing her husband did when they exited the car, she remembers, was to check under the tires to make sure no one was caught in the wreckage; luckily, the couple and the restaurant patrons escaped the crash without any injuries. Patel was interviewed by police and firefighters but didn’t receive a citation. The Tesla still appeared to be drivable after the crash; Bhavana remembers the tow truck operator driving it to his truck afterward. Tesla declined to pay for damages because they blamed Bhavana for the crash, according to a letter she saved. Much like the people who submitted complaints to NHTSA last month, Patel found the letter she received from Tesla to be frustratingly short on specifics. It describes the data logs but does not show them to her. “We have determined that there was no unusual or abnormal activity with respect to your above-referenced vehicle and that it was operating within normal operating parameters at the time of the incident,” Tesla said in the letter. Tesla’s data logs indicated that “you increased the accelerator pedal position from 1% to 50% in less than one second without depressing the brake pedal,” the company wrote in the letter. 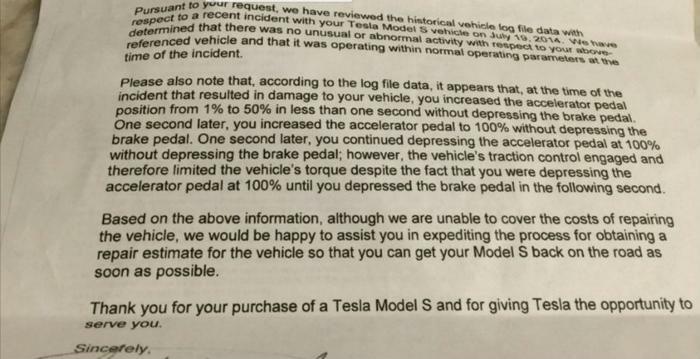 While the letter from Tesla claims she pressed the gas “at 100%,” it does not specify how much force she applied to the brake in the following second. It also does not say how fast the Tesla was traveling in the moments before the crash. “..although we are unable to cover the costs of repairing the vehicle, we would be happy to assist you in expediting the process for obtaining a repair estimate for the vehicle so that you can get your Model S back on the road as soon as possible,” Tesla told the family. But according to the repair estimate the Patels later received, fixing the car would cost over $68,000, all but guaranteeing that the insurer would total it. Bhavana was surprised that the estimate was so high, considering that the car still appeared to be drivable, but the experience made her wary of electric cars regardless. She switched to a gas-powered car, and the family’s insurance rates shot up after they were sued by the restaurant’s owner. Last year, the Guardian newspaper published an article describing how Tesla refused to provide detailed data logs to consumers who reported problems with their vehicles. Instead, the newspaper accused the company of providing data to the public only as a political maneuver if it suited the company’s public image. “While the company has handed data to media following crashes, it won’t provide its customers’ data logs to the drivers themselves,” Guardian reporter Sam Thielman wrote. Thielman’s article focuses on drivers who reported crashes after using the car’s so-called self-driving technology. It describes the tech company as throwing its customers under the bus by releasing sensitive information about their crashes without permission. “The Guardian could not find a single case in which Tesla had sought the permission of a customer who had been involved in an accident before sharing detailed information from the customer’s car with the press when its self-driving software was called into question,” the report says. Tesla’s press office did not return messages from ConsumerAffairs.